Motorola Device Manager is a small tool that allows you to connect your Motorola Smartphone and Tablets to the Windows Computer. Here, on this page we have managed to share all versions of Motorola Device Manager Released. It comes as auto-installer package. Simply install the setup package and you are ready to connect your device to the computer without installing the drivers separately. It comes with inbuilt USB Drivers that allows you to connect your Motorola device to the computer and browse contents of your device through the computer. You can also download the Morotola USB Driver Separately from here. It allows Motorola users to update their devices (only selective models). This feature is nearly waste, as it doesn’t support majority of Motorola devices. If you ever wanted to remove Moto Device Manager from your computer along with the Motorola USB Driver then simply Go to the Uninstall or Change Program Option and Select Moto Device manager and you are done. [*] Motorola Manager isn’t like other PC Suite Applications, and it comes with lots of limitations. It only allows you to connect your Motorola Device to the Computer and Update the Device (if available). [*] How to extract Driver: If you wish to learn how to extract USB Driver from Moto Device Manager then watch how to extract official usb driver from Motorola Manager. [*] Recommendation: Install Motorola USB Driver, instead of installing the Moto Device Manager. As because Moto Device Manager is a useless tool that doesnt have any basic interface and features. And in case if you installs it, a 24/7 process will be running on your system all the time. 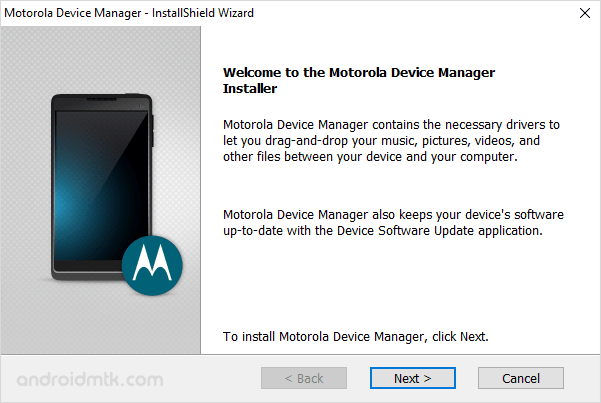 [*] Credits: Motorola Device Manager is officially created and distributed by Motorola Inc. So, full credits goes to them for sharing the tool for free.